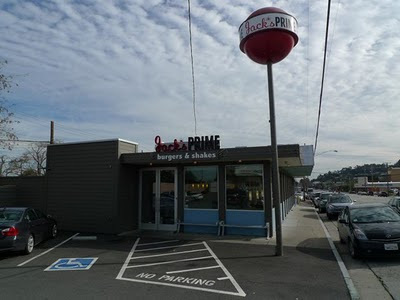 Jack’s Prime Burger’s & Shakes in San Mateo, CA came highly recommended by a fellow burger enthusiast. I wasted no time in getting my self to the clean, modern looking place to give a burger a try. Jack himself greeted me at the door and showed me to a wood-tabled booth. 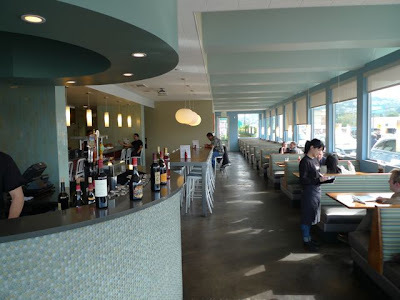 I compliment Jack for not going for the faux chrome-and-white-tile 50’s diner look, but rather a more authentic and classy mid-century vibe in the converted shell of the old hubcap store on El Camino Real. 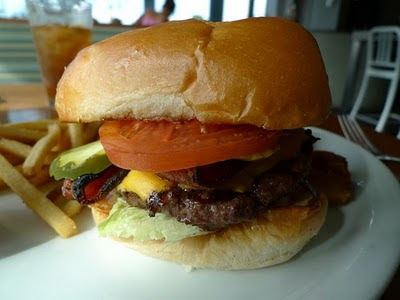 A diminutive young lady with a British accent, like Jack’s, quickly took my order of Jack’s Prime Classic Cheeseburger ($9.00 with bacon added). It also comes with shoestring fries. The fries are normally $2.50 on their own, but there are a whole host of other sides offered including onion rings, sweet potato fries, fried pickles (all $3.95 each) or Irish Nacho Fries ($4.50). My server nicely offered to make my fries a half and half with onion rings. Perusing the menu, I am intrigued to go back and order the Ultimate Bacon Burger with maple bacon mayo and bacon in the burger. The burger was delivered to my table in less than ten minutes on an impressive plate with fries, onion rings and fixings, which included pickle strips placed artfully in an X, lettuce, tomato slices and onion. The crisp and tasty bacon sat on top of melted American cheese. The bun was puffy white with an X cut in the top. The patty itself is made from 1/3 pound of Meyer Ranch natural Angus Beef. It is not ground on site, but brought to the store and cooked fresh. I found the burger to be cooked perfect medium, juicy and flavorful. The Thousand-island inspired sauce was updated with what I think was a little dill for a nice twist. Among lots of new burger places lately, this the best new burger on the Peninsula since the Counter opened in Palo Alto. The onion rings were beer battered and crisp with sweet onion in the middle. The first were a little too thick for what I would call shoestring – more about the size of MacDonald’s fries. They were hot and fine, but not as outstanding as the burger. I will definitely be returning to Jack’s. I liked the vibe as much as the burger.